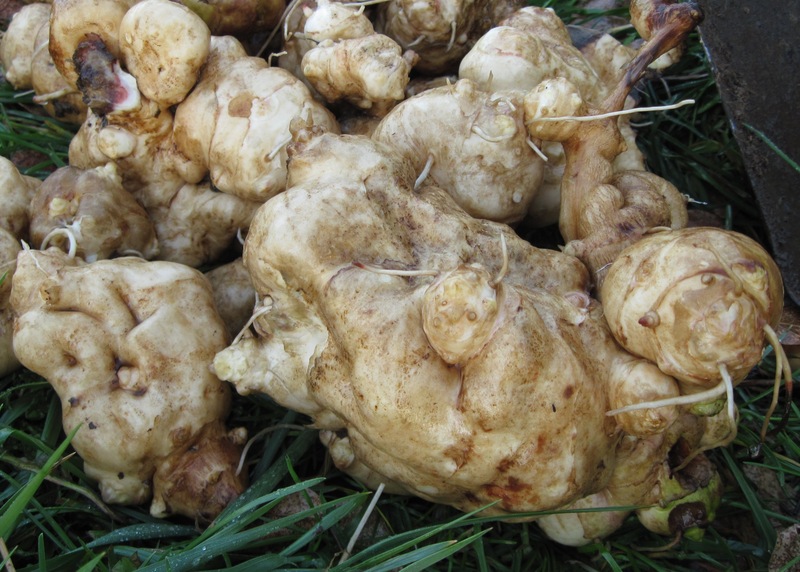 Jerusalem artichokes look like thick, pale gingerroots. Does your spouse refuse to eat Jerusalem artichokes because they’re too—err—windy? Have you yourself abandoned your Jerusalem artichoke patch to the weeds or the pigs, because no human of your acquaintance would eat the damn things again? If so, you have plenty of company. If you can’t quite place this native North American vegetable, you may know it instead by a name invented by a California produce wholesaler in the 1960s: the sunchoke. The sun part of this moniker comes from sunflower, because the plant is closely related to the sunflower that provides us seeds for birds and snacks and oil. Jerusalem artichoke blooms look like small sunflowers, and they can grow just as tall. Sunroot would be a better name for the vegetable than sunchoke, because Jerusalem artichokes certainly are not artichokes, and they have nothing like the hairy, inedible part of an artichoke that is called the choke. Yet the two vegetables known as artichoke are discreetly similar in their chemical makeup and flavor. Samuel de Champlain noted this in 1605, when he found Indians on Cape Cod growing roots with “le goust d’artichaut,” the taste of artichokes. Both artichokes and Jerusalem artichokes, he may have observed, share a peculiar sweetness. This sweetness comes from inulin, a kind of soluble fiber that passes through the human digestive system intact until bacteria go to work on it in colon, releasing a lot of gas in the process. Artichokes are rich in inulin. Jerusalem artichokes have about half again as much, by percentage of fresh weight. I thank Rose Marie Nichols McGee, of Nichols Garden Nursery, for asking the question I should have long ago asked myself: Can fermentation rid Jerusalem artichokes of their windiness? Rose Marie posed that question about a year ago, and the two of us promptly decided to conduct an experiment. After digging up the little patch of Jerusalem artichokes that I’d ignored for ten years, I brined a pint of the rhizomes according to the kakdooki (Korean fermented daikon) recipe on page 64 of The Joy of Pickling, with garlic and powdered chile. Rose Marie developed another recipe based on one of mine, she said, although nothing about it sounded the least familiar. 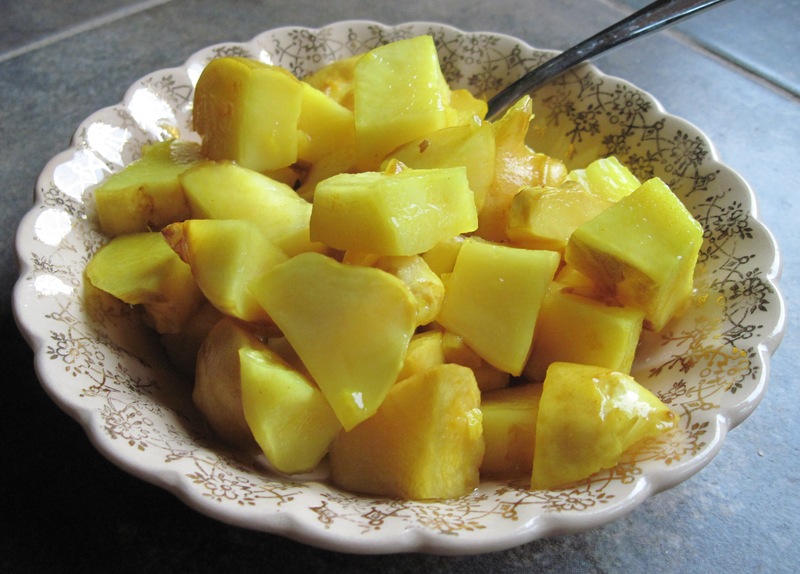 With a stroke of brilliance, she added turmeric, so that her pickled Jerusalem artichokes turned out a brilliant yellow. We shared both pickles, hers and mine, at a Slow Food board meeting, and people seemed to find them both tasty. I requested follow-up digestive reports. But I got none. Was this good news? I couldn’t be sure. Apparently nobody’s bellyache was bad enough to prompt a complaint. But, then, the meeting attendees hadn’t actually agreed to tell me about their gas problems. Some of them may have felt they really didn’t know me well enough. And none of them had eaten more than a small handful of the pickled rhizomes. So the results of our study were inconclusive. In digging up my Jerusalem artichoke patch, however, I must have missed a little rhizome. Last summer, sans weeding and sans water, a single nine-foot sunflower stalk shot up. I could experiment some more! I waited through most of the winter to dig up the rhizomes, because time alone has been said to convert much of the inulin in Jerusalem artichokes to fructose. In January, I harvested a crop just as big as the previous year’s, at least ten pounds. Several nights of temperatures around 0 degrees Fahrenheit had done the rhizomes no harm. I first assessed their windiness by simply roasting some with salt, pepper, and olive oil. The roasted rhizomes were delicious, but still gassy. Toss together the diced Jerusalem artichokes, the turmeric, the garlic, the ginger, and the cumin. Pack the mixture into a jar with a capacity of at least 6 cups. Dissolve the salt and sugar in the water. Pour the brine over the Jerusalem artichokes; it will not cover them at first. Add a brine bag (a gallon freezer-weight plastic bag containing 1 tablespoon salt dissolved in 3 cups water) or another suitable weight. The next day the brine should cover the Jerusalem artichokes. If it doesn’t, add more brine mixed in the same proportions. Wait several days before tasting the pickle. I found it perfect after a week: The brine was sour, and the Jerusalem artichokes pleasantly, mildly spicy and still crunchy. When the pickle has fermented enough to suit your taste, store the jar in the refrigerator. Keep the Jerusalem artichokes weighted so they won’t take on a grayish cast. Several people have now eaten this pickle in potentially distressing quantities. The test subjects remained on site this time, so that if reports didn’t come verbally they would emerge in another form. And nobody has suffered. I hope that these results will be duplicated by other investigators. Let me know, OK? Don’t be shy. 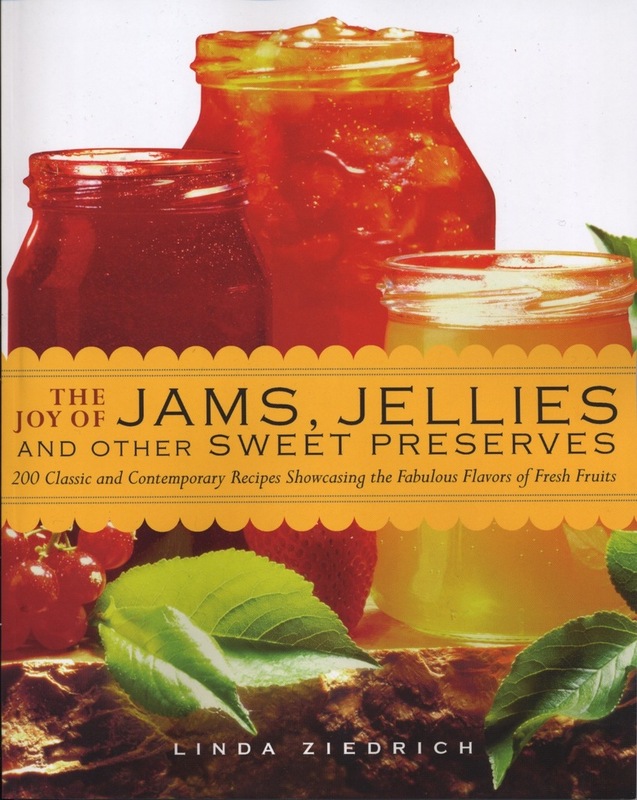 This entry was posted in Fermented foods, Food history, Pickles, Preserving science, Vegetables and tagged fermentation, inulin, pickles, recipe, sunchokes, sunroots, topinambour. Bookmark the permalink. ah, yes, fartichokes! I do grow them — although we only eat so much of them – a few roasted and in soups… But they are pretty in a blowsy sorts of way, and my cochin chicken love them enough to help with harvesting. No side effects noticed on them. I use the dry stems for kindling – they work wonderfully. I also make a pickle similar to the ones above (I understand they are a traditional Southern pickle), except I slice the tubers like coins, add some onuons and a hot dry pepper or 2. They are welcome with a plate of saucisson. And it’s always fun to have people guess what they are… they don’t, but are generally intrigued by the artichoke taste. No side effect noted either when they are vinegar-pickled. Will you report on the lacto-fermented ones? Sylvie, thanks for sharing your experience. I actually don’t remember anyone complaining about aftereffects of eating vinegar-pickled Jerusalem artichokes, but then I don’t remember anyone eating them in quantity. The fermented pickle here is mild enough in flavor that people tend to eat more of it at once. So far no ill effects have been reported. What a brilliant idea for taming sunchokes! I once read that they’re meant to be eaten only after they’ve been stored or overwintered in-ground, which encourages the indigestible starches (inulin) to convert to sugar — a bit of lost knowledge. To accomplish the same thing, Harold McGee recommends cooking for 12-24 hours at low temps around 200°F. I also tried cooking Jerusalem artichokes very slowly, in a slow cooker, but that method seemed ineffective. Perhaps I shouldn’t have included onion, another rumbly vegetable. Thank you Linda, for this forthcoming and funny post. After the experience with Yotam Ottolenghi’s from his Jerusalem cookbook, Roasted chicken with a full pound of Jerusalem artichokes, which was delicious but obviously too much of a good thing, I thought I would never make anything with Jerusalem artichokes again. But with your recipe at hand I am definitely reconsidering. Very useful. We cook out with a herb called summer savory in English or more appropriately bean herb in dutch. (bonenkruid) which does help somewhat. Interesting! I didn’t know that summer savory was supposed to help with gassiness. We also pressure cooked them to start and then cooked them into a souffle a couple of days later thus time which may have helped. I started these about a week ago and first there was some foam, I suppose from the fermentation. I then put them in the fridge and when I checked today the liquid had turned gooey, almost slimy, yet the color and smell are still the same, just very garlicky. Is that consistency normal and are they safe to eat? I have little experience with fermenting so I want to make sure it is OK. Thanks. Nadia, gooeyness and sliminess are bad signs. I don’t know why the fermentation went wrong for you, but eating slimy Jerusalem artichokes might cause more digestive distress than eating raw ones. Sorry about that. All right, I discarded them. Thanks Linda. has anyone ever made “Dill ” artichoke pickles? 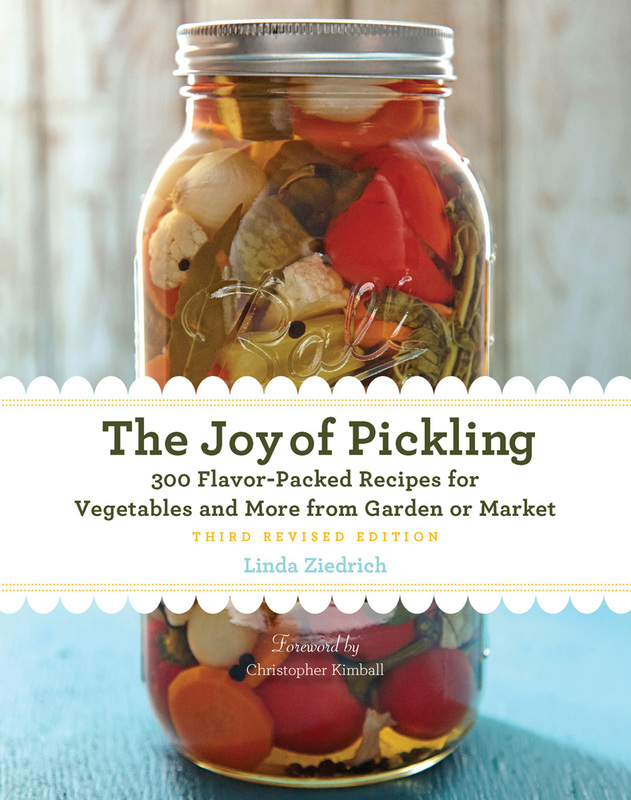 Linda, do you mean pickled Jerusalem artichokes with dill? Or pickled artichoke hearts with dill? I’ve pickled them successfully and there were no ill effects to my guests, even eating a great quantity of them. They are wonderful sliced and pickled with turmeric and mustard seeds. I served them with a platter of cheese and cured meats. I also like them cooked into a soup although they still promote a certain amount of gasiness that way. Thanks for the recipe, I will try your fermentation method. anyone try a little baking soda? Nancy, although baking soda can definitely relieve stomach gas, I’ve never heard that it helps with gas produced by bacteria in the intestines. Interesting idea, Nancy. Baking soda proves useful in so many situations that the writer Bill Bryson suggested that if someone ever comes up with a solution to nuclear waste it will probably involve baking soda! With a fridge full of fermented veg, I keep meaning to ferment some sunchokes. I’ve heard they are particularly rich in PREbiotics that the PRObiotics love to eat (not sure if it was inulin or something else). I’ll dig some when the ground thaws. Thanks for the inspiration! I have quite a patch of these growing, wow they are strong growers! Our ground is soft and I will try this as soon as it is dry enough outside to allow digging. I am an enthusiastic fermenter of vegetables and I have found that there is often a stage about 7-10 days into the fermentation, depending on the temperature–where one can find a gooey consistency to the brine. I panicked the first time I encountered this, and so I did a little research. The guru of fermentation, Jonathan Katz, has written about this and recommends trying to leave the fermentation one or two weeks longer. I tried this and found it to be true–if I left these ferments go another two weeks, making sure to keep them packed, keep the surface clean of visible spores, and keep all veggies well under the brine–the gooey stage would pass and the ferment would be watery again. and would be delicious! Now, slime, especially pink slime or moldy slime, is another story. If you see this, it is best to throw out your batch. But If there is no color to your goo and it is about midway into a good fermentation, try letting the batch continue to see if it dissipates. If it does, and tastes and smells good (“ripe” is ok) and has no visible signs of spoiling or mold, it is safe to eat. Also, if slime or goo appears after a month or more, it is probably mold, not part of the natural fermentation. This rule would apply to fermenting sunchokes just like cabbage, carrots, beets, or radishes. Has anyone tried Asafoetida Powder? Also known as hing. It is used in eastern dishes and is said to remove the windy effects of food. I use a little in things like my black bean chili. With three boys in the house this was a blessing. Thanks you the advice. I will see if I find it at Wholefoods this week. Do I need to boil the jars when making this type of pickle? Judith, boiling the jar isn’t necessary, but do be sure that it is well washed. Bay leaf is said to make beans more digestible. I wonder if that would help with sunchokes? It couldn’t hurt, at least! I have just harvested a whole bunch of large roots…but they have a malodorous smell and are surrounded by a black layer that may be a mildew. Though it hasn’t been very cold here in London, the plant beds are soaked; perhaps this has lead them to rot? The thing is that they are still crisp. I am loathe to bin them, but after scrubbing, not all has come off. Seems a shame to waste them. Have any of you ever encountered this problem before? On the farm we had a very high water table, so sometimes I would dig up rotten Jerusalem artichokes. I’m surprised that yours are still crisp, though black and smelly. Still, it sounds as if rot has set in. You probably don’t need to throw out all of the roots, but I would cut away any parts that are discolored or stinky. Years ago when I first discovered sun-chokes AND fermenting, I made a big batch of sun-choke kim-chi. That is when I found out about the gassiness problem. Reading the above article and comments makes me want to try again. This time I will wait until later in the winter to harvest, and I will try your recipe. Fingers crossed! Let us know if you have better results in late winter, OK? The tradition on mainland Europe is to boil a potato with them and this should eliminate the gassiness… a friend swears by this although I haven’t tried it out yet…. I can’t guess how the potato might help, Cassandra, except by balancing the Jerusalem artichokes with a more digestible food. But if you try this and it works like magic, let us know, OK? A traditional Southern artichoke pickle! One advantage of a spicy, vinegary pickle like this is that most people won’t eat very much at a time. The best way to cope with any gassy vegetable, I suppose, may be simply to avoid eating too much at once. My Pennsylvania dutch grandmother used to make very crunchy pickled artichokes with a plain vinegar, salt and water brine that was processed in a hot water bath. She always kept some plants in her garden. There was never any mention of anyone experiencing gassiness or tummy aches from them and since they were my favorites, I ate as many as she would let me have. I’ve made them myself from grocery store sunchokes recently and no problems here as an adult either. Thanks for visiting my The World’s Fare blog, Linda. I’ve certainly enjoyed exploring yours. As for sunchokes — I didn’t even know there was an issue. Must be one of those things that doesn’t affect everyone. I love them sautéed — but I’d be interested in trying the pickled version you’ve offered us. Hi, Cynthia! I think that different people respond differently to gaseous foods, and that individuals respond differently at different times of their lives and even on different days. I looked up your blog after listening to your talk “How Corn Changed Itself and Then Changed Everything Else” to the Greater Midwest Foodways group (http://greatermidwestfoodways.com/index.php/page/MidwestMaize2015). I couldn’t understand all of the podcast, because the sound quality was poor, but I was fascinated all the same. I will have to read Midwest Maize! thanks for this linda, you’ve just solved my jerusalem artichoke problem at a stroke! i’ve been growing them for years on one pretext or another (this year it was as a windbreak for asparagus), never can resist the size, the vigour, the air of wholesomeness…& then i always end up with piles of the damn things lying around the kitchen dessicating while i try & slowly up the dose from homeopathic to trace to minute…now i’ve just got a few jars of pickle parked in there being rapidly munched through every time someone goes past. only digestive implications so far were when i tried a load early in the process to see what’d happen, which i don’t think counts really. also, my partner, who has long objected to the distinctive taste, even when i chop a small amount really finely & hide them in a stew, is happily crunching through them at a similar rate to me. i suspect the objection to that taste is a learned reaction from past experiences, don’t know why the pickling process dissipates it so much though? i’ve always assumed that was the taste of inulin, since you get the same sort of thing from scorzonera & other composites, & surely there must be plenty of it left after fermentation. anyway, thanks for the recipe…& also the general method. starting now to wonder why i’ve been buying vinegar all these years. by the by, irit, i’m in the uk too but on very sandy soil, & this year i had a patch of partly blackened but still firm tubers too. i assumed it was a bacterial infection, cut the black bits off & the rest were fine. although i noticed the ends near the blackness had that sort of red tinge they also get when rats have been at them, which i think is some sort of self defence. anyway, they seem to really like the sand, getting twice the size they were on my previous clay allotment. maybe they don’t like the wet & thats made them more susceptible to getting ill? i’m not sure these mild winters are our friend either, seems like a lot of pests & diseases that’d usually be dormant or dead might be up & about. maybe the black rot is one? i’ve never noticed it before this year. I’ve seen the black rot, Rich, after the roots have been under the water table for an extended period. I imagine that freezing would also cause the roots to blacken and rot. I’ve seen the red tinge, too, but it has never seemed problematic to me. I’m glad you like the pickles, and thank you for mentioning scorzonera, which is new to me. I’ll have to try planting it! Thanks for your details Rich, I’m in British Columbia and mild damp climate with fairly hot summer but have had little luck on sand but did well in clay loam…mind you we had built up the area a good degree with compost and spent duck yard straw. Have done similar here but over sand,,,so maybe year 3 will be better. I have a higher rat population here maybe and that may be affecting success. i’ve got right into scorzonera the last few years. doesn’t normally get very big for me in one season, but the great thing is, though its usually described as an annual crop, it is perennial & the roots don’t get fibrous or woody or anything, so you can just leave it to get bigger til you’re ready for it. meanwhile the leaves make quite a good salad base, fairly bland & a bit chewier than lettuce, & they’re around for quite a lot of the year. thats my main use actually. you can eat the buds in the same way, though i normally leave it to flower- rather nice, like a tall dandelion. Excellent to know. Started some scorzinara from seen and this will be year two for the roots so will thin in spring to see where I’m at. Rich, it’s great to know that scorzonera has several good uses. Thank you! I will be trying this myself and reporting back but what a great post! Am trying to get a plot of these guys going but living on plain sand seems to be difficult for most of my veg trials, two years since moving here…gotta build soil life. Anyway, they grew quite well for us in the heavier clay soil we had previously. The ducks loves them and the rabbits got the stalks in moderation. Have had the roots raw, boiled, baked and in soup, however we found fermenting them was the best for reduced gas and ease of digestion. It’s the only way I personally can eat them. In an Italian style mixed veg ferment with hot peppers they came out fab and my mouth waters in anticipation of getting some put up this coming year. They are nice in that they do seem to keep their crisp where other veg soften. Thanks for sharing your experience, Marney. I’m glad to know that fermenting Jerusalem artichokes has worked for you. My understanding is that the inulin (a probiotic) in Jerusalem Artichokes is the indigestible element. If you parboil the root for one minute before sautéing or pickling, you’ll eliminate the gas and bloating that occurs when the root is eaten in a raw state. Mary, Jerusalem artichokes become probiotic only after they are fermented. When they are fresh, their inulin is prebiotic; that is, your intestinal microbes can digest it, but you can’t. This is why many people suffer gas and bloating after eating Jerusalem artichokes. Very long, slow cooking–as Native Americans used for inulin-rich camas roots–will convert much of the inulin to fructose. A minute of boiling, however, will help very little. Very good to know, thankyou. Though its early November here in Vancouver BC, we dug up one container grown sunchoke plant, I hope its not too early. We bought the perfect pickler and want to ferment these on the counter for 4 days. Have you heard of the perfect pickler? They use an airlock on a wide mouthed mason jar and of course salt water brine. Any thoughts on this? Kelly, the Perfect Pickler should work just fine. It is one of a bunch of airlock devices I describe in The Joy of Pickling. Just dug a fat bed of chokes. Love the flavor, but I’d better be tethered somewhere pretty soon or I’ll float away. My partner the same. I will try both the pickle and the slow roast, and see if I can make better use of the abundance (and decide to replant. They do very well here overwintering in the ground. Any food that needs almost zero attention to grow and store has my vote. Just need to eat it somehow!). One question: Why the additional sugar in the pickle recipe? Is it essential, a fermentation speeder-upper for a vegetable whose sugars aren’t too available? I am not opposed to using sugar, just curious. Good question! I suspect I have 2 teaspoons sugar in this recipe because I started with my kakdooki (fermented daikon) recipe, which calls for just that much sugar for the same weight of roots. Most kimchi recipes include a little sugar, to make sure that fermentation gets off to a good start. If you try the recipe without the added sugar, please let me know how it turns out. Double cooking is said to eliminate gas with Jerusalem Artichokes. Baked then pureed into soup , or boiled then sliced & baked into a gratin with other veg, par boiled and fried maybe too? Thanks for the pickle recipe,I have just harvested a bucket full here in Australia. Thanks for the tip! Double cooking sounds worth a try. I suspect it might work by lengthening the overall cooking time. I did a lactoferment when I was growing them and didn’t seem to have any issues. Another thought is, I have a feeling between dormant phase and active growth that inulin levels may differ. When harvesting after being in the ground all winter they seemed much better than fresh fall harvests. I was given several pounds of the nubby things last week. I roasting several in my oven and also made some chips with thin slices of them…man were they tasty! Knowing full well the repercussions many had had I still could not resist and ate entirely more than any human should of any one thing at any one time. And I paid the equal price! All. Night. Long. I read this article before any of that, and have decided I would pickle the rest of them once I had finished my roasting vs. Frying experiment. I have given myself a couple days of recooperaton and I’m ready to try the pickle method. I shall return to tell you my results! This is interesting, Juliet, because if you are in the Northern Hemisphere those nubby things must have sat in the ground all winter and well into spring, slowly converting their inulin to fructose (of course, large amounts of fructose can also cause digestive distress). I hope the pickling works for you. Well, thank you everyone. What an amazing thread started in 2014 and still going strong around the world! Even though I knew of the repercussions I would suffer I still had to cook up a batch of my first harvest for the year – they have their own patch so they don’t spread too far. Suffered all night. Last year I read somewhere that genetics will play a role in the actual “degree” of suffering, some hardly noticing the gas effect at all. I’ll try feeding some to the hens and will try double cooking at the end of winter. I do think Jerusalem artichoke and cream soup is sublime. Thank you for this informative article. Useful, interesting, humorous and well-written. Thanks too for all the comments. I just planted some Jerusalem artichokes and some yacon rhizomes today. We had sunchokes growing years ago at another property. They are one of the most reliable crops I’ve ever encountered. I look forward to experimenting with pickling them next year. Best wishes from New Zealand… Stephen Coote. Thanks, Stephen! For the first time this year I’m also growing yacon–another interesting vegetable that we might chat about in the future. I did a little research piece on these bad-boys, and I’m planning on doing a follow up. I’m going to use your recipe (because it sounds delicious) to ferment these for a microbiology final. After that, I’m going to prepare Jerusalem artichokes in different ways and make graphs (farts per unit of time). I’ll do a graph for your pickles. Time will tell. Thanks for this interesting article! P.S. Your tid-bit on Tobias Venner is awesome. I’m going to have to visit that source and retool my article because of that. Thanks! Great, Kevin! Will you be the only human subject? You won’t eat anything during the experiment except Jerusalem artichokes, right? What fun! I’d love to see your report. P.S. It will only be me. This “study” isn’t really apart of the project. I’m just going to throw it in there for fun. I have been thinking about trying Jerusalem artichokes with similar method and ingredients to gakdukki (sp?). I was surprised to see that you tried it. Thanks for the inspiration and excitement offered through your bubbly events. I was able to replant about 100 pounds this year and am planning on using them at my family restaurant. Very excited to be able to offer some staple and organic produce in a tasty form. Steven, you really planted 100 pounds of Jerusalem artichokes? I guess you’ll be serving them all year around! i’ve been eating them for a few years with no problems until i had them at a restaurant for the first time the other night: at the restaurant they were cooked. i never cook them myself. so, maybe jerusalem artichokes are only a gassy problem when they are cooked and not a problem at all when they are raw. Or maybe, because they were cooked and soft, you ate more of them than you usually eat raw? Finally I‘ll be able to safely eat Jerusalem Artichoke! We grow jerusalem artichokes and however we cook them, soup, roasted (when we certainly do eat too many as this is delicious) or even raw we have suffered with wind to quite an extent. Having read the recipe for the pickle (yet to try) I decided to add grated ginger, turmeric and cumin seed to the two person portion of soup I had in the freezer to see if there was any effect. The soup was delicious – tasting mildly curried – and there was a a great improvement on the flatulence – in fact hardly any at all – so will now try it again to make sure that it wasn’t just a fluke and if so will in future add all three spices to any future soups. Notes on ginger, turmeric and cumin all mention that they are carminatives which help reduce flatulence but so far I have never seen a spiced recipe for jerusalem artichoke soup. Diana, what a good idea to add carminatives to the soup, especially when they are such flavorful spices. You might try fennel as well. I made the soup with the same proportions of everything in the pickle and we had no ill effects from the very tasty spicy soup so the first wind free trial was not a fluke. The only problem is that there was not much of the nice artichoke flavour. The pickle is fine as well. Would add that the artichokes were particularly windy this year for some reason so it was a good result. Thanks for the report, Diana. I’ll write about my own experiments with Jerusualem artichokes this past winter as soon as I find my notes. Thanks so much for the pickling recipe. I grow this beautiful plant and look forward to delicious soup every year. I also love them roasted. I have always found that the key to avoiding wind is to introduce back into the diet slowly. Inulin is a probiotic and the healthy bacteria (particularly bifidobacteria) in your gut will thank you for eating it, but too much at once causes a population explosion which results in cramping and gas. Start with just a few slices in a stir fry or soaked in acidulated water and added to salads. Other people have commented that cold will break down inulin and this is true, so storing them in the refrigerator will lessen the farts, but now you have also lost the benefits of inulin. I make a big batch of soup at the start of the season and freeze it. I suspect this also helps to counteract their propensity to cause gas. Starting slow and working up to a big serve of them sees the whole family enjoying them every year with no problems, and out guts are healthier as a consequence. Thank you, Meg! I’ve rarely seen Jerusalem artichokes sold in stores, but when I have they have been in a refrigerator case rather than in room-temperature bins with the potatoes and other roots. I wonder if refrigeration makes store-bought Jerusalem artichokes less gassy than those fresh out of the ground or stored in a cellar. How come no one has asked if these are supposed to be covered or not while fermenting? Lorene, fermenting vegetables are normally covered, to keep out insects, dust, and mold spores. How you cover the vegetables depends on your equipment. If you use a quart or two-quart jar and weight the vegetables with a water-filled plastic bag, no other covering is necessary. A crock may come with a lid, or you might cover the crock with a towel or pillowcase. Thankyou for all of this information, well written and described by everyone . . I’m looking forward to our first harvest come fall. I like the information regarding winter harvesting though..Guess we’ll do both including some pickling. Reblogged this on Muncie Permaculture Project. I’m just starting to get into lacto-fermentation and I’ll have to try this recipe next time I’m swamped by Jerusalem artichokes! The last time it happened (thanks to the CSA I’d joined) I tried roasting them. They turned into marvellous little caramelized nuggets of deliciousness and I ate far more than I intended to….and I swear, a few hours later the results presented themselves and I had to cancel my plans for the weekend. The worst gas ever! And I grew up eating vinegar-pickled Jerusalem artichokes all the time with no ill effects. What a sad story, Anna! Do you think you ate more roasted Jerusalem artichokes at a time than you ever did vinegar-pickled ones? The vinegar slows down your eating, right?